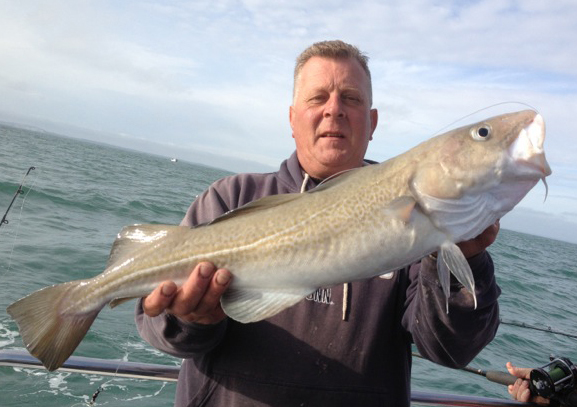 During the Summer months our Cod fishing is 30-50 miles off shore on the English Channel Wrecks, here we mostly fish on the Drift and look to put lures right into the 'Tins' to lure the Cod away from the safety and feed rich features. As the water temperature drops towards the end September and into October, the Cod start to migrate inshore to feed and eventually spawn before moving off to alternative feeding grounds in early spring. The Winter Cod run is historically thought to follow the Sprat and Herring shoals, which still remains a matter of debate. One thing is for sure, they reappear on the Wrecks by late May and June and the circle goes on. The rough ground marks along the Hampshire coast, East of Wight, the Solent and the infamous Nab Tower all draw and hold Big Cod in the Winter months. Most of the marks feature depths of about 80-150ft and can be fished Down Tide or Uptide in those at the shallow end of the scale. For your Up Tide fishing a 12-20lb rod capable to casting 6-8oz + bait will be required, again braided lines should be 30lb with 80lb snoods. Casting from a Boat should always be done with the lead starting and finishing outside the Boat (ie not the deck) area. There's a set protocol when doing so and if unsure please ask for a demonstration. Safety of all anglers is paramount. 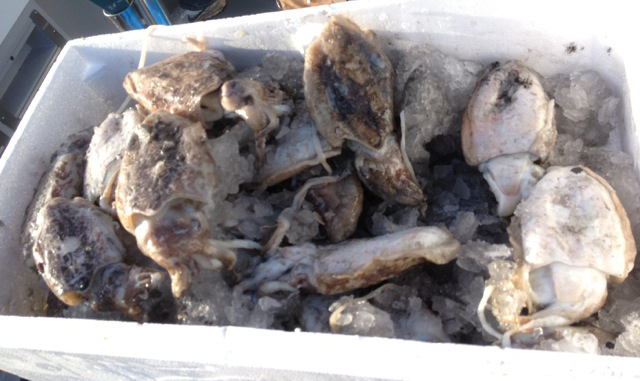 Ultimately, Squid, Lug, Crab and Cuttle will be the baits used. 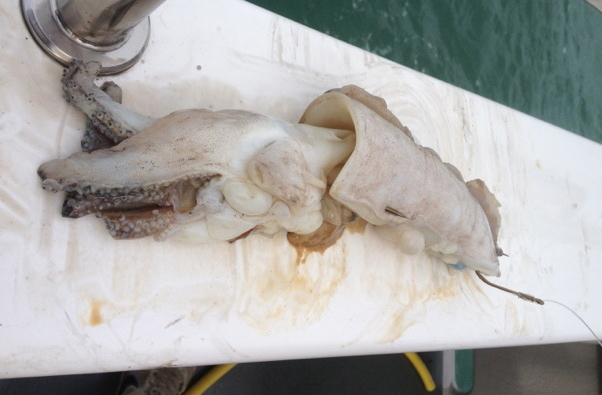 A mass of Lug or a Peeler Crab stuffed in a single Squid will help delay the Whiting and provide a good Cod bait in normal situations. However, there's more and more interest in catching BIG, Very Big Cod over the last few years. Whilst it appears there's more and more of these fish around - or reported upon via the Angling Presses as being so. There's certainly more call for waiting it out on BIG bait. It's no secret that Cuttle has been the most consistent BIG Cod bait off the south coast for some time. Further inshore, Crab and Lug will score best as ultimately this is what the fish are feeding on a few hundred yards off the coast, but drop into 100ft of water and it's Cuttle that's number one. Quite often there's competition for the baits with hordes of Whiting and strap Conger providing a break in for motionless rod tips. The cuttle keeps the Whiting at bay for a while but the big scent trail put down will pull Conger onto the feed as well as the target Cod. 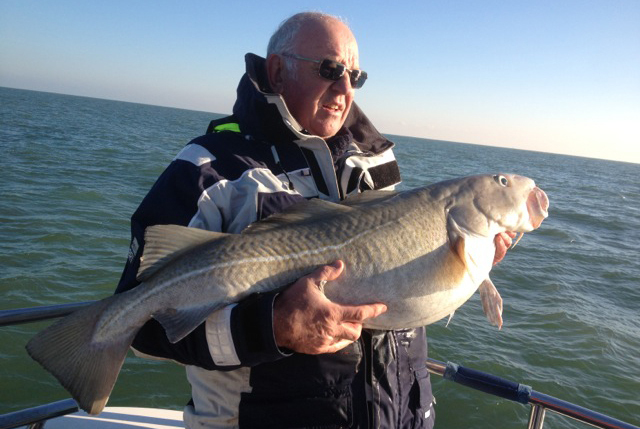 Whilst the Cod fishing is a waiting game, the Conger fishing when they're having it provides us with some great winter sport. Likewise, those fishing lighter can put a few decent Whiting together for the table on most days. Bring plenty of Cuttle with you! At the end of your snood create a loop with a simple overhand knot (a figure of 8 is best) and pull it tight and trim. Thread a bead followed by a Size 6/0 Mustad Viking Pennel hook up to the loops knot. Create a simple overhand (not a figure of 8) knot to trap the bead and swivel in the top 4 inches of the loop. Now simply take an 8/0 Mustad Viking and thread the loop through and over the hook and pull tight again. You want to use some heave snood line and make sure a doubled over loop will go through both your bead and your hooks eye. If that all sound a bit complicated, which it really isn't, just use at least 100lb mono. The pennel hook is best secured with silicon tubing as big mono will buckle when twisting around the hook, you'll get a better presentation too. They're not all Massive, but they're all Welcome! If you can get hold of them Cox & Rawle 'Meat Hooks' SCR25 6/0 + make for some brilliant Big Cod / Conger hooks and have a good sized eye. On the 'Other Side' of the Isle of Wight, around the Needles area, it's common to use shrink tube and have a flying paternoster, but that's a bit beyond the basics and I'd like to keep things simple here. Maybe we'll add a diagram at a later date.